TUI GROUP has informed President Juan Carlos Varela of its decision to include the province of Colon among its tourist destinations starting from November.During a meeting in Berlin, Thomas Ellerbeck, an executive from the German group, explained that 10 cruises run by the tour operator will dock in Colon as part of their service in the Caribbean. President Juan Carlos Varela was pleased by this news as it means an influx of tourist to Panama. He said “this great news means the arrival of more than 30 thousand new tourists to Colon,” adding that the announcement by TUI is a good indication of the growth to come in Colon once the infrastructure is improved by projects that the Government is currently working. “Renovation of the city of Colon and Colon Puerto Libre will increase the potential for tourism in the province significantly,” he said. 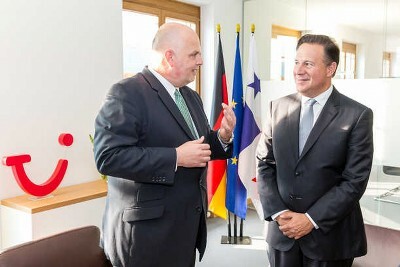 The TUI GROUP Berlin Corporate Office hosted a reception for Juan Carlos Varela and his delegation comprising the Minister of Economic Affairs and Tourism Minister as well as Panama’s ambassador to Germany to speak further about development of tourism in Panama, as RIU, a TUI company, operates two hotels in Panama, one in Panama City and another in Playa Blanca.